Our product range includes a wide range of fully automatic swing arm type band saw machine and automatic swing arm band saw machine. 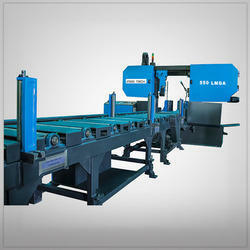 We are a reckoned name engaged in offering Fully Automatic Swing Arm Type Band Saw Machine to our clients. Our offered machine is manufactured by employing modern technology keeping in mind the current market trends and technology. Moreover, our offered machine is characterized by adjustable hydraulic up and down movement. We are a paramount organization, engaged in offering Automatic Swing Arm Band Saw Machine. Our offered machine is engineered with quality assured materials which are procured from certified vendors of the market to ensure its durability. Moreover, it is in-built with especially designed electrical console.